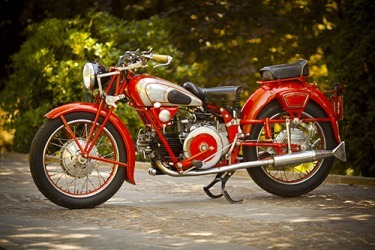 This vintage Italian motorcycle is a retrospective look at the way they were designed in the early 20th century. The definition of retrospective is looking back on something that happened in the past. When you are interviewed about past events, this is an example of a retrospective interview. An art exhibit showing an artists early works progressing to the artist's most recent works is an example of a retrospective exhibit. "retrospective." YourDictionary, n.d. Web. 19 April 2019. <https://www.yourdictionary.com/RETROSPECTIVE>. looking back on or directed to the past, past events, etc. Looking back on, contemplating, or directed to the past. Applying to or influencing the past; retroactive. Of, relating to, or being a retrospective: a retrospective art exhibition. An exhibition or performance of works produced by an artist over a considerable period.